This lullaby doesn’t necessarily have the most catchy lyrics, but once the melody is familiar to your child it could serve as a nice introduction to another great composer. When I was looking up versions of Golden Slumbers my youngest fell in love (or, more accurately, was mesmerised by) the version below, but don’t forget there’s also a Beatles version if you’re after something a little less saccharine! A favourite with my children ever since watching Mr Peabody and Sherman. See the little bunnies sleeping ’til it’s nearly noon. Shall we wake them with a merry tune? They’re so still, are they ill? Hop little bunnies, hop then… stop! The version on this video is slightly different from the version I usually sing, but I like it because it prolongs the bouncing – sometimes with really little kids it takes them so long to get up and bouncing that the song is nearly finished by the time they’ve got going. Of course, you can always just sing the hopping section twice through… or pause for longer while everyone gets up (if the rest of your group is patient enough). And while we’re bouncing rather than sleeping, here’s another great favourite. I love this version, from the brilliant Putumayo Animal Playground album. This one can be as long or as short as your knowledge of farm animals/vehicles/crops and the noises they make! I don’t know why she swallowed a fly – perhaps she’ll die. There are a fair few variations on this one; I’ve included some of the most common verses I could remember below. Not everyone includes the ‘aye aye yippee’ chorus, but it certainly drags things out if you’re looking to build up your singing stamina! Coming round the mountain when she comes. Aye aye, yippee yippee, aye! It’s up to you how many men end up going to mow this meadow, but here’s a song that is good for counting up with each verse and then counting back down rapidly every time. One man and his dog (‘woof!’) went to mow a meadow. Two men, one man and his dog (‘woof!’) went to mow a meadow. This classic action song, more usually known as the hokey pokey outside the UK, can keep little ones moving for quite some time – especially if you add extra verses to identify and isolate different body parts (shoulders, elbows, wrists, knees etc.). In, out, in, out, shake it all about. You do the hokey-cokey and you turn around. Tomorrow it’s pop song suggestions, I hope you’ll join me for some woo-hoo and way-hay action! As with yesterday’s post about action songs, 5 (or 6) songs is just a very small sample of all the wonderful options available, but hopefully I’ve included something in this selection which is new to you or an old forgotten favourite. Five currant buns in a baker’s shop. Bought a currant bun and took it away. Subsequent verses start with the remaining number of buns until they are all gone. A lot of these counting songs also count as action songs – with this song you could either use your fingers to represent the currant buns, or if you have a group of children you can act out the whole song with children as the customers, the baker, and even the currant buns if you have enough people. Similarly to the currant buns song, subsequent verses start with the remaining number of ducks until they have all swum away. I like to include the final verse below to keep things cheery! …And all five ducks came swimming back. Eating some most delicious bugs. Yum yum! Then there were just four speckled frogs. Glug glug! Again, this one counts down from five with each verse, with the final line being, Then there were no more speckled frogs. Glug glug! If you fancy some variety, or more of a mathematical challenge, you could try this starting with ten frogs and have them jumping off in twos. This is also a great song for introducing the idea of syncopation (stress on the off-beat) – try clapping the rhythm of the song emphasizing the syllables capitalised here, Five LI-ttle speckled frogs sat ON a speckled log. This continues counting down to one in the bed, until the last person in the bed says, ‘I’m lonely’, or ‘goodnight’. There’ll be nine green bottles, hanging on the wall. I thought I ought to include at least one song that counts up rather than down! Tomorrow I’ll suggest some longer songs… the sort that can keep you occupied/drive you crazy on long car trips. Inspired by a Facebook conversation started by my dear friend Philippa (of the fascinating Thinking on my Feet dance blog), this week’s posts are going to be suggestions for songs to sing with your child or listen to together. Few, if any, of these will be new to you – many are very well-known old favourites – but maybe one or two will jog your memory if you’ve got stuck in a rut singing the same songs over and over (Let it Go, anyone?). This familiar song is a good full-body warm up! Sung while tapping or pointing to the relevant body part with both hands. Subsequent verses omit singing body parts, taking one more away with each subsequent verse (you can substitute a ‘shh’ to remind smaller kids) while still tapping them. Sometimes the final verse is sung in full but as quickly as you can manage the actions. Young kids sometimes find the arm rolling action in this song tricky, but it’s good fun working on it. Pull, pull, clap, clap, clap. Point to the window, point to the door. Clap your hands together, 1, 2, 3. Actions are rolling hands around each other as you wind the bobbin up (changing direction on the back again) and pulling hands apart, clapping, pointing etc as suggested by the lyrics. 3. Tommy Thumb, Tommy Thumb, Where Are You? This one is a nice introduction to individual finger dexterity. Tommy Thumb, Tommy Thumb, where are you? Subsequent verses introduce Peter Pointer, Toby Tall, Ruby Ring and Baby Small. If you are teaching your child about the fingers you can wiggle the appropriate finger on the first line, encouraging them to join in on the second line. If your child already knows the rhyme you could both hide your hands for the first line, and both bring out the appropriate finger on the second. This is another fun one to get the whole body moving. We’ll all be merry and bright. The lyrics are pretty self-explanatory; I’ll leave it to The Wiggles (sorry!) to demonstrate. I don’t want to leave the toes out, although you can do this with fingers, too. The finger-play for this is to wiggle each toe in turn starting with the big toe (NB. I do mean that you should use your fingers to wiggle your child’s toes – it would be pretty impressive to be able to wiggle each toe independently! ), and at the wee wee wee it’s time for tickles. I like this one because it helps young piano students get the idea of the finger numbers we use (thumb starts as 1), and they need to remember which hand is on the right. Which finger did it bite? This little finger on the right. I hope there is something in this list to get you singing and moving. I’ll be back with some more counting songs tomorrow. Summer Camp Week 4: I’m bored! So, of course, we haven’t managed to get through the long summer break without hearing ‘I’m bored’ a couple of times. Usually I just send the kids off to play (unless it’s me who is bored!) and they’ve forgotten they were bored within seconds, but last week I decided to embrace the boredom and let it inspire our first family song-writing session. I found a big piece of card and set the kids to work writing and drawing things that they thought were boring and things that definitely weren’t (I prompted them by asking about activities, books, foods, songs, places, etc). We’re bored, bored, al-ways bored. We’re bored, bored, ev’ry day bored. We’re still working on some verses talking about the ideas they sketched out and attempting to disprove the premise of the chorus! 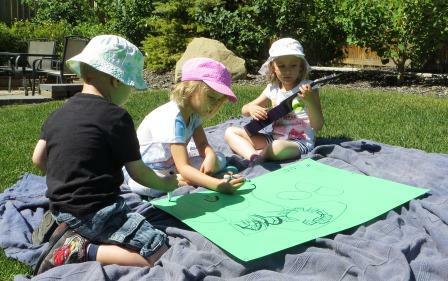 This could qualify as a very quick activity as you need only go so far as brainstorming some ideas – in our case that seemed to be enough to remind the kids that actually they weren’t that bored at all. Convert your ideas into lyrics or a poem. Set your lyrics to an existing tune or compose your own. Make your ideas into a craft project and make a big BORING poster, with written ideas, drawings, collage etc. Practice together, and perform your masterpiece! This is an activity we keep returning to – I’m hoping we’ll have an end product at some stage but, even if not, we’ve had a good time trying to be songwriters. And it’s never a bad thing to be reminded that there’s plenty of fun stuff happening in our lives! Here’s another quick activity requiring no preparation other than finding pen and paper. We made a Venn diagram of some of the children’s favourite songs. 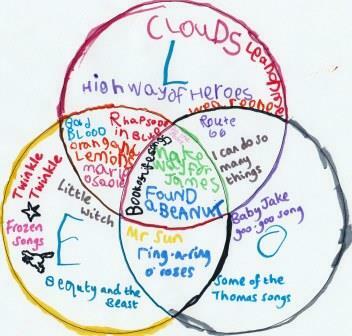 This sparked lively conversation about songs, plenty of singing and dancing, and taught the kids about Venn diagrams. Lovely! We are also working on a 2-circle version showing music that makes us dance, music that makes us feel sleepy, and music that makes us do sleepy dancing! You can draw your circles freehand, find some suitable-size mugs or plates to draw around, or you can download my blank 2- and 3-circle Venn diagrams below.